The first step to improve your chess tactics skill is to make an in-depth study of tactical motifs and checkmate patterns. This will improve your ability to exploit targets in your opponent’s position. Why is it so important to train chess tactics? Because winning a game of chess usually relies on your ability to create the tactical combinations that will undermine your opponent’s defenses. It’s a well-know fact among strong chess players that training your tactical skill is the quickest way to improve your chess. Did you know? Many chess players train tactics by simply solving hundreds of chess puzzles. This is NOT the best way to improve your chess tactics skill. On this page you will find the tools and training methods that will REALLY make a big difference in your results. A chess tactic is a move, or a forced combination of moves, whereby you make progress towards achieving your objectives–whilst limiting your opponent’s options. Tactics involve making threats against targets in your opponent’s position. Exploiting these targets includes the use of well-known tactical patterns such as forks, skewers, discovered attacks, interference, x ray etc. What Is the Difference Between Chess Strategy and Tactics? In chess, tactics and strategy often go hand-in-hand, but there is a distinct difference between the two. Chess tactics are mostly known as a forceful combination of moves–whereby you win material or give checkmate. Such decisive tactics usually become possible as a consequence of an oversight (blunder) by either of the players. But even though tactics and strategy aren’t the same thing, they work in unison in that tactics are often used to achieve strategic objectives. Why should you study the fundamental building blocks of chess tactics? Understanding the underlying mechanics of tactical combinations is the foundation for improving your chess tactics skill. When you simply solve tons of chess puzzles, you may discover some of these fundamentals by chance, but your training will be much more effective if you know what to look for. PRACTICE your skill by regularly solving chess puzzles. This section will specifically deal with the first item — to learn the fundamentals of chess tactics. In chess, a tactical target is a piece or square that you can threaten or attack. Without targets there can be no tactics. It’s important to study and understand the common targets that make tactics possible. A hanging piece is simply chess jargon for an undefended piece. It’s important to understand that even if a hanging piece is not in immediate danger, it is still vulnerable target because a threat against it will usually require an urgent response. Win a tempo since you will be forced to spend time to deal with the threat against the hanging piece. Exploit the hanging piece by means of a tactical pattern. Diagram above: Black plays 1… Qd4+, which simultaneously checks the exposed white king on g1 and the hanging bishop on b4. White will be forced to get out of check, after which black will capture the undefended bishop, 2… Qxb4. This example also illustrated another common tactical target known as an exposed king. You should now understand why it’s generally a good principle to keep your pieces defended even when they’re not immediate danger. There may be some situations where hanging piece can be safe, but you should still be aware of the possible dangers. A special case of a hanging piece is known as an exposed king. A king becomes exposed when it’s not complete shielded by other pieces or pawns. An exposed king is very vulnerable to checks and tactical threats. Diagram above: White obviously advanced their f2-pawn at an earlier stage of the game. Even though it may not have been a mistake at the time, it was important for white to be aware that the missing pawn on f2 exposes their king and that it could be vulnerable to checks and therefore, a possible target for black. Tactics that involve an exposed king are usually very effective because defensive options against a check are very limited. This is also, in part, why the safety of your king is an important strategic consideration. A defender is a piece or pawn that defends or protects other pieces, pawns or important squares. The white knight on c3 is a defender of the white queen on d5. Diagram above: A defender (white’s knight on c3) performs an important task, that is why it can itself become a target for an attack. The diagram illustrates why a defender is in itself also a target that can be exploited in tactical combinations. Higher-valued pieces, particularly the queen and rooks, can be threatened by any piece (or pawn) that has a lower value. With regard to targets, high-valued pieces are similar to hanging pieces in the sense that they are quite vulnerable to threats. Diagram above: Even though black’s rook on d4 is defended by the pawn on c5, it’s still a target for white’s knight (due to it’s relatively higher value). White can use the awkward position of black’s rook to gain an important tempo. Diagram above: White’s move, 1.Nf5! attacks the rook on d4. (Even though the rook is defended by the pawn on c5, black doesn’t want to trade the higher-valued rook for the knight.) However, white wins an important tempo for their knight because on the next move they can play 2.Ne7+, forking the black king (and rook on c8). Either way, black will lose some material. You can now see that the one down-side of high-valued pieces is that they are vulnerable to threats from lower-valued pieces. The geometric relation between pieces can turn them into potential targets. Such relation generally refers to pieces (or squares) on the same rank, file, diagonal or knight-move apart. Diagram above: The squares h8 and g5 are geometrically related to a knight-move. To the untrained eye this relation is not obvious. It is even less obvious how white could turn this relation into a tactical combination. Diagram above: The moves 1.Qh8+! Kxh8 2.Nxf7+ followed by Nxg5 demonstrates the knight-move geometric relation between h8 and g5. White exchanges the queens but wins the black rook in the process. If at any moment you notice that a particular piece becomes very limited in its mobility, you should investigate whether it’s possible to trap it. Diagram above: Black just played 1… Bb6? moving their attacked bishop to a safe square. However, on b6 the black bishop is very limited in its mobility and white can use another tactical idea (winning a tempo) to trap and win the bishop. Diagram above: White’s move, 2.c4! wins a tempo against black’s hanging knight. On the next move white will use the extra tempo to play 3.c5! to trap and win the black bishop on b6. It’s a good idea to be aware of the mobility of each and every piece on the board. If you can’t win the piece, you could also aim to restrain that piece for as long as possible. Restraining the mobility of an enemy piece can often give you a temporary advantage. Diagram above: White plays 1.Qe5. This move makes a threat against the hanging rook on b8, but it also makes a threat against the h8-square (Qh8#). Although a piece-exchange is not a target in itself, it often is the forerunner to creating new targets in the position. Diagram above: At a first glance the moves 1… Nxe3 2.Qxe3 appears to be a straight-forward piece exchange. However, after 1… Nxe3 2.Qxe3? black actually created a new (and better) target! Diagram above: Black can play 2… Bd4, pinning the white queen (the new target) to white’s king. The lesson here is that you should always calculate seemingly pointless piece-exchanges because they can sometimes reveal new targets in the position. There are often tactical opportunities in the area of the board where you have a local majority of force. That is also why it is a strategic objective to aim for a local majority on a specific area of the board. Hanging (undefended) pieces can be used to gain tempo moves or to win them in tactical combinations. An exposed (unsafe) king is a permanent target that can easily be combined with other threats. The geometrical relation between pieces, in example – pieces on the same diagonal, file or rank. A piece with a very important defensive task can become a target for an attack. A piece with more than once defensive task can become overloaded and exploited. Pieces in attacking positions have more flexibility than pieces in defending positions–and thus more opportunity for tactical maneuvers. A majority of forces in a certain part of the board can outnumber the defenders and create opportunities for a tactics. A piece with severely limited mobility can sometimes be trapped or kept out of the game. There are many themes and patterns you should train – check out the chess tactics themes and patterns on the chess tactics training room page. We just saw that a simple piece-exchange can create a new target in the position. Similarly, a series of direct threats often precede new and unexpected tactical opportunities. Diagram above: White’s move, 1.a3, appears to be a simple threat against the black bishop. However, this move leads to a forced tactical opportunity. After the moves: 1.a3 Bc5 2.Rc1 b6 3.b4! white wins material. Diagram above: White’s seemingly simple threats lead to this position where black’s bishop is pinned and white will win it. The power of a move that carries a simple threat is often underestimated! Even when the threat seems too obvious to be harmless, it could be the first step towards a position that presents new tactical opportunities or, at the very least, improves your position. Note: In some cases your opponent can deal with your threat and at the same time improve their position. In that case, your move was not a real threat – it was an imaginary threat. Imaginary threats are not always bad, but keep in mind that they don’t carry the same dominating authority that comes with real threats. A common mistake in chess is that you think about your own moves but neglect to consider your opponent’s ideas. It’s tempting to think that your opponent is forced to respond to your threats right away. However, your opponent could make a counter threat (also known as a counter tactic) which can quickly complicate matters or even leave you in a worse situation. Diagram above: White (Ehlvest) just played 1.Bf6 to pin black’s rook on g7. White is threatening Qxg7# on the next move. What did black do? 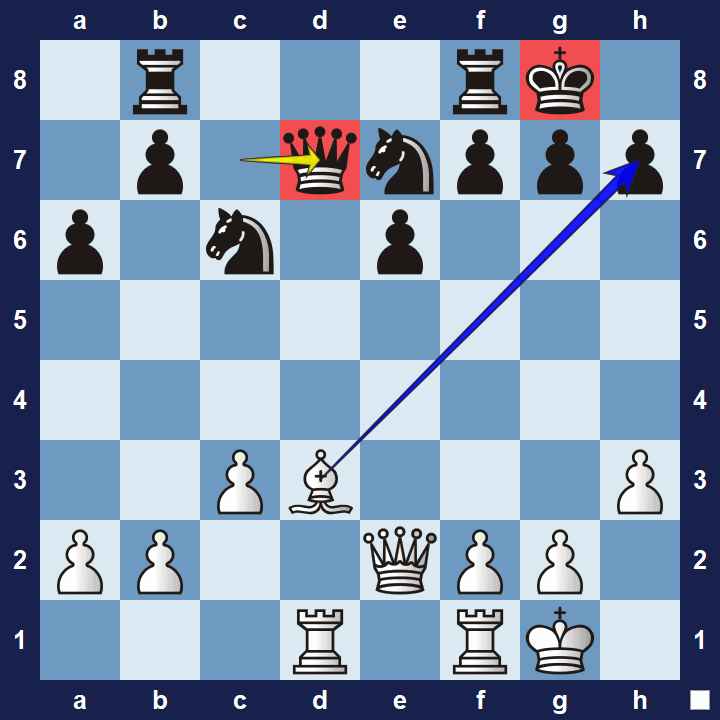 Diagram above: Kasparov played 1… Qd1+! White resigned because the queen on g4 is pinned by black’s rook on g7. On the next move black will capture the white queen, 2… Qxg4+. The lesson here is that you should also think about the moves your opponent could make. Direct threats often result in winning a tempo. Winning a tempo refers to a useful move that improves your position and makes a threat at the same time – and forces your opponent to defend in a way that isn’t useful to them. Winning a tempo can often lead to the discovery of new tactical opportunities which wasn’t already obvious in the previous position. Diagram above: White plays 1.Nf5 (threatening Nxd4), winning a tempo against the black rook on d4. White’s idea is to use the free tempo in order to play 2.Ne7+ (forking black’s king and rook on c8) on the next move. In essence “winning a tempo” means you get a “free move” which often gives you an opportunity to improve position, whilst denying your opponent the same. A tactical pattern (also know as a tactical motif or theme) is a known tactical idea that you can use to exploit targets. Pins, forks and discovered attacks are typical examples of tactical patterns. Diagram above: By playing 1.Nd7, white uses the fork pattern to exploit the knight-move geometrical relation between the two black rooks. Can’t black simply capture the knight? Diagram above: After 1… Qxd7? white can play 2.Bxh7+! This is a discovered attack on black’s queen because on the next move white will play 3.Rxd7. As you can see, a good understanding of how tactical patterns work can help you find tactics in your games. You will also find a list of chess tactics to study on this page. Being aware of the whole board. Finding chess tactics in a position can be a lot easier if you use the right technique! Find all the possible targets in the position and then look for a combination to combine threats against 2 or more of those targets at the same time. Find a threat to which there is no good defense. Find a threat which cannot be defended (or can only be defended by creating another weakness). Your tactical awareness helps you sense where and when it’s worth to spend extra time on calculating the variations. It relies heavily on your ability to keep track of the interaction between all the pieces–not only on a certain part of the board, but on the board as a whole. and to do visualization exercises. Chess tactics servers can be a great source of chess puzzles where you can do chess tactics training. I compiled a list of chess tactics servers that you can try. How often do you go back to specific chess problems that you did a while ago? A professional golf-player will practice one aspect of his swing over and over and over… Why then should we not do the same when solving chess puzzles? Coming back to a certain set of puzzles once in a while can help your mind to not only understand the pattern or theme better, but also to automate your mind’s recognition of the patterns. Why should you improve your chess tactics? Therefore, improving your chess tactics is the quickest way to improve your chess. But the problem is–many chess players try to improve their tactical skill by solving tons of chess puzzles. This is not the best way to train tactics. There are more tactical ideas to learn than you may realize! Maybe you’ve heard about pins, forks, discovered attacks, removing the defender, a weak back rank etc. These are the well-known tactical patterns (or motifs). But the list goes on: Interference, decoy, x-ray… And going from one puzzle to the next is not an effective way to learn about all these tactics. To effectively master tactical patterns, it’s a good idea to study each unique pattern as a subject. What is a Chess Tactics Pattern? Qe4! Threatens Qxh7+ and Qxa8. A fork. It’s useful to know tactical patterns! In essence, tactical patterns (or motifs) are ways to create or exploit targets in your opponent’s position. There is usually much more to a chess tactics pattern (or motif) than appears on the surface. By making an in-depth study of a specific motif, you will improve your understanding of how the motif works in different situations. Furthermore, this way of study will help you notice interesting and “less-obvious” ways in which these motifs can be used. White plays Bxh7+ (discovering an attack by the Rd1 on Qd7). Black must deal with the check, which means on his next move white will capture Qd7. White to move, what would you do? The key to finding the solution in the above example, is to have a good understanding of the discovered attack motif. The hidden idea: All the squares beyond the Bd3 (d4-d8) are indirectly attacked by the Rd1 (due to the possibility of the discovered attack, Bxh7+). White can play Nd7, forking Rf8 and Rb8. The point is that Nd7 is indirectly defended, ie. Qxd7? allows discovered attack, Bxh7+, winning the Qd7. As you can see, a good understanding of how the motifs work, will help you find more tactics in your games. Your knowledge of the important patterns will help you calculate variations more effectively. You will make fewer mistakes and be able to take advantage of your opponent’s mistakes. You can achieve strategic advantages by means of tactical combinations. This is hard work, but well worth the benefit you will get from doing so. Here are some tips on how to study chess tactics by motif. Study a collection of tactical puzzles that feature specific patterns (motifs). Try to find unique examples that illustrate various ways in which the motif can be used. Identify the targets that were exploited by the motif. A motif is in essence a way to exploit targets. By studying how the targets were exploited, you will will also get a better understanding of the motif. How Many of the Important Chess Tactics Patterns Do You Know? Strong chess players know them all by heart because they know it helps them calculate deep variations. This is why many chess coaches say it’s important to train tactics, and it’s true. But, it is even more important to train patterns! In any field of expertise, a good vocabulary on the topic reflects the depth of your understanding. This fundamental idea is true in chess too. Expanding your vocabulary in the field of chess tactics is the foundation of an effective chess tactics training method. The most important words and phrases in the language of chess tactics. A Threat. A threat is a move that threatens to obtain an advantage on the next move, such as capturing a piece, threatening a tactical combination or even securing a positional advantage. Counter-threat. A counter-threat is a move whereby you effectively ignore a threat against you but make an even stronger threat against your opponent. Counter-threats can be very effective, but there are risks involved and you should calculate the consequences carefully. Winning a tempo. Winning a tempo refers to a useful move that improves your position and makes a threat at the same time – and forces your opponent to defend in a way that isn’t useful to them. In essence it means you get a “free move”. Making tempo-moves can often lead to the discovery of tactical opportunities you couldn’t foresee in the previous position. Targets. A target is a piece or square that is vulnerable to a potential threat. Typical examples include an exposed king or undefended pieces. Defenders. A defender is a piece that defends/supports other pieces or squares. Exchanges. An exchange refers to the event where you capture an enemy piece and they recapture you in return. Exchanges bring about important changes to the position and can often be used to remove important defenders or to create new targets. Tactical motifs. A motif is a tactical idea you can use to exploit targets. Pins, forks and discovered attacks are typical examples of tactical motifs. Note: Threats vs Winning a tempo. Not all threats are useful. A threat only wins a tempo if it forces your opponent to defend passively. If your opponent can defend in a way that is also useful too, then your move didn’t win a tempo. White’s threat (bxa5, diagram left) does not force black to make a defensive move. Black responded with the attacking move Qh5! (threatening Qxh2# diagram right). Moves that win a tempo are always moves that make a threat against a target. A good awareness of the targets in your opponent’s position can go a long way in helping you find effective tempo moves. Targets are pieces and squares you can make threats against. Undefended pieces (or “hanging” pieces) often present opportunities for you to win tempos since it’s easy to make threats against them. Undefended pieces can sometimes be captured in a tactical combination. An exposed king is often the most vulnerable piece on the board. Since a player’s responses are severely restricted when their king is in check, “check-moves” can be used to win tempos. You can also look for ways to combine a threat against the exposed king with threats against another target, such as an undefended piece. A piece with important defensive tasks (a defender) is required to stay in it’s position to fulfill its defensive role. Logically then, this piece can itself can become a target. A piece with severely limited mobility can sometimes be trapped or you can make a tempo-move by threatening to trap that piece. The trapped piece can be won by tactical means or you can further restrict that piece and prevent it from becoming useful to your opponent. How do you know when to look for tactics in the position? In a real game you do not have enough time to be looking for tactical combinations with every move. Even if you do have enough time you will exhaust yourself to such an extent that your level of performance might even unknowingly drop. Knowing when to look for tactical combinations is a skill which is just as important as the skill of finding tactical combinations. The key to know when to look for tactical combinations is to develop a tactical awareness. The exercises on this website are developed with this in mind. You will not only train the skill to find tactical combinations but you will train your mind to instinctively know when it is worth to spend time on searching for a tactic. Don’t move on to the next chess puzzle until you have a deep understanding of the patterns that made the tactics possible in the puzzle. See if you can figure out which aspects of the position actually made the combination possible. This style of chess tactics training will hone your “tactical awareness.” You will begin to instinctively look for chess tactics themes in positions where you see telltale signs of these tactics. Summarize the tactical solution with a short sentence. This short sentence will answer the essence of what the tactic in the position is all about. I fear not the man who has practiced 10000 kicks once, but I fear the man who has practiced one kick 10000 times. How often do you go back to specific chess tactics puzzles that you did a while ago? For some strange reason, I’ve noticed that chess players tend to think it is a waste of time to repeat a puzzle they’ve seen before. This is very far from the truth. A professional golf-player will practice one aspect of his swing over and over and over… Why then should we not do the same when solving chess puzzles? Coming back to a certain set of puzzles once in a while can help your mind to not only understand the pattern or theme better, but also to automate your mind’s recognition of the patterns. It is vital to make this knowledge your second nature. It is better to understand a few patterns deeply than to understand many patterns superficially. Patterns you understand deeply will be much easier to apply! Understanding the tactical themes is useful… but training your mind to recognize the theme instantly and apply it in your game is only possible once you have turned your understanding into a skill. So how do you turn your understanding into a skill? Practice, practice, practice. Practice till you can apply your understanding almost without thinking. Your calculation method is another very important aspect of your development as a chess player. A well-developed calculation skill will help you avoid mistakes, but more importantly – it will also increase your confidence! But you must also keep in mind that your ability to calculate chess tactics will rely heavily on your visualization skills. Visualization refers to your ability to see in your mind the positions you will reach if certain moves were to be made. The point is that you can see this imaginary positions in your mind without moving the actual pieces on the board. The skill to visualize possible tactics in your mind long before they actually appear on the board, gives you a serious advantage over any opponent who can’t do it. Your visualization skill will improve over time by simply playing chess often and by spending a lot of time on training chess tactics. However, if you find that you often think about your next move and end up looking again and again at the same variations – you may want to give your visualization skill a boost. This is exactly what the revolutionary Visualwize training program will help you achieve. It’s a great feeling to achieve a good position, particularly when you achieve it against a strong player. But the same great feeling can quickly turn into frustration if you just can’t find a way to take advantage of your superior position. On an amateur-level, tactics often become possible as a consequence of an oversight or a mistake. But among stronger players, tactical opportunities mostly appear as the result of a better position. We can conclude that your ability to convert a good position into a concrete advantage relies very much on your tactical skill. So Then Chess Really is 99% Tactics? This famous quote by Richard Teichmann has often been debated by chess players. Some claim that it’s a complete exaggeration. It probably is, but it draws needed attention to the importance of training tactics – which believe was Teichmann’s intention when he said it in a manner of speaking. Tactics are critical, a requirement, because one oversight can end the game right away. But you need to think about your strategy too! Are there any tactics in the position? How can I improve my position? Chess is not only tactics. Tactics and strategy work together to help you achieve your objectives. Did my opponent’s last move make any new tactics possible? If I play my intended move, will it give my opponent new tactical opportunities? These questions will of course be a lot easier to answer once you get better at chess tactics! The quickest way to start winning more games is to do chess tactics training! But you must do it right to get the best results. Did you know? Many players train do chess tactics training by simply trying to solve hundreds of chess tactics puzzles. This is NOT the best way to improve your chess tactics skill. On this site you will find the tools and methods to REALLY make a big difference in your results. Every move in your game is important. Surely you have seen for yourself how one mistake could instantly put you in a really bad position? If you miss one tactical move you can lose material. Or you could allow a checkmate. Your game could over with one bad move. You will instinctively know when it is worth spending time on searching for a tactical combination. You can quickly exploit a bad move of your opponent if you can find a tactical combination against his move. It helps you avoid moves which your opponent can exploit with a tactical combination. You can achieve strategical advantages by using tactical combinations. You can do a “blunder check” against your chosen candidate moves to see if your move is not a tactical blunder. You will instinctively improve your understanding of chess strategies. Knowledge of different tactical patterns is important but it is even more important to develop your knowledge into a skill. This can only happen if you regularly do chess tactics training with high quality tactical exercises and seek to deeply understand the factors which made the tactics possible. What Is the Best Way to Train Chess Tactics? Maybe you’ve heard about chess players who complain about solving hundreds (or thousands) of chess puzzles but they don’t improve much? Maybe this has happened to you? Understanding the tactical motifs (or patterns) is useful, but training your mind to recognize tactical opportunities in your own games–that is the skill you really want to achieve! So how do you turn your understanding into a skill? Targeted practice. Practice till you can apply your understanding almost without thinking. It’s important to get a good understanding of how tactical motifs work in simple, as well as more complex positions. When you solve tactical puzzles with this goal in mind, your training will become far more effective. Which elements of the position became the targets that made the tactics possible. When should you look for tactics in the position? Knowing when to look for tactical combinations is a skill which is just as important as the skill of finding tactical combinations. The key to know when to look for tactical combinations is to develop your tactical awareness. Therefore, when you are training tactics, you should also aim to develop your tactical awareness. Don’t move on to the next chess puzzle until you have a deep understanding of both the 1) themes and 2) the patterns that made the tactics possible in the puzzle. At the bottom of this page I’ll give you a few examples to demonstrate the best way to do chess tactics training. But before we continue, it’s important to have a good understanding of the fundamentals of chess tactics. You can greatly improve your understanding of tactics by studying the definitions and examples of all the important motifs in the complete list of chess tactics below. Note: The examples below are easy to understand. Their purpose is simply to illustrate the various tactical motif. In time you will study the same motifs in more complex situations. Pin tactics occur when an attacked piece cannot move without exposing an even more valuable piece (or target) behind it. Diagram above: Black’s bishop pins the knight on c3. If the knight moves, black will capture the rook on a1. Skewer tactics in chess occur when an attacked piece must move to safety but will expose a lower-valued piece (or target) behind it. A skewer tactic is sometimes referred to as a “reversed pin”. Diagram above: White intends to play their bishop to c4. This move will skewer black’s queen on g7 since the queen has a higher value than the rook on g8. A fork is a tactic whereby a single piece makes multiple threats at the same time. Even though a fork is sometimes referred to as a double attack, they aren’t quite the same thing. Diagram above: White plays 1.Qd4 and makes two threats at the same time: 1) Qxg7# and 2) Qxb6 – a fork tactics. A double attack is when you create multiple threats with one move. Although a fork and a double attack are often used interchangeably in chess, it’s technically not the same thing. Diagram above: White can play 1.Ng5! threatening 1) Qxh7# and 2) Nxf7# at the same time, creating a double attack. In chess, an X-Ray tactic occurs when two of your pieces defend one another “through” an enemy piece. Diagram above: White plays 1.Bxd7. Note how the white queen and bishop defend one another “through” the black queen (X-Ray). The X-Ray tactic can surprise your opponent because it’s easily overlooked that your pieces can defend one another even though an enemy piece obstructs their line-of-sight. When a piece or pawn performs an important defensive task we refer to that piece as a defender. And since the piece is defending something important, the piece itself becomes vulnerable. Removing the defender is one of the most important tactical motifs you should study. Trapping/forcing opponent into a repetitive discovered attack. Is already a passed pawn or can suddenly become one. Important Note: It is a good idea to know these checkmate patterns by name. Knowing a pattern by name can help you significantly in recalling the particular checkmate pattern. Don’t only study the checkmate patterns below, but try to memorize their “names” too. There are a number of very good chess tactics servers. Most of them are free, with an option to pay for more features. You can do an unlimited amount of chess tactics puzzles here, for free! A premium paid membership on chesstempo gives you access to many extra features that can be useful for advanced training. Lichess tactics server is plain but useful. Give both a try and decide for yourself which you prefer. Or alternate them if you want a change now and then. All the tactics exercises are curated (hand-picked for their instructional value). The solutions to the puzzles are explained in simple language so that you don’t have to face the frustration of not understanding the solution. The exercises are grouped by motif to help you study patterns in an effective manner. The chess.com tactics trainer uses a timer and penalizes you for taking more time trying to solve the puzzles. I’ve seen chess students rush through the puzzles because they are afraid of the rating penalty. Rushing through the exercises is damaging to your thought process. We understand that in a real game you have a time restriction too, but in this case we are doing a specific exercise – training tactics – and it’s ok to spend a little more time on it. At chesstempo.com you at least have the option to train with the timer or not. 5 free exercises per day is not a lot, particularly if you consider that there is no limit on how many exercises you can do on the chesstempo or lichess tactic servers. The chesstempo website offers unlimited free exercises and you have the option to train against the timer, or not. With all that said, chess.com tactics trainer is still a great tool, particularly if you are unfazed by the timer. The chess24 tactics server has many features but I personally find the current layout and functionality a bit clunky. Maybe you like it, so give it a try and compare it to the other options. Important Note: The true value of solving tactics puzzles lies in the opportunity to improve your understanding of the factors that made the tactic possible. Study the examples in the pages below and pay careful attention to the comments in the “which factors made this tactic possible?” sections below the examples. Examples – How to study chess tactics. I’ll give you a few examples to demonstrate how you can get the most value from training chess tactics. Exercises. This is where you turn your knowledge into skill – practice with a goal in mind! Do these exercises regularly until you can do them with your eyes closed. Remember it is not the quantity of exercises you do but rather how deeply you understand the exercises you have already done. The most important task in this chess tactics list is to study the solutions till you understand and know them by heart. Please feel free to share your comments on this page in the comments below. If you want to contribute to further improve this article on chess tactics, I’ll welcome that too! 1.gm Yuri Shulman/chicago “Sacrifice something; tactics/combinations often involves a sac; either at the beginning, middle or end of the variation. 2. Yusupov Find all possible (even if not plausible) ACTIVE MOVES. 3.Queen sacs; always ask is there a queen sac. RE vocabulary: Translate chess concepts to words that are your own, thereby making the concept more user-friendly. 5.When calculating always as before you move: how can this be a blunder? 6.Before all tactical tries, ask, can I improve my position? Have I completed my development? Is this sac/ tactic premature?